Nasturtiums if you have them! Combine dressing ingredients in a small bowl. Whisk well and set aside. Bring a medium saucepan of water to boil. Boil rice vermicelli 3 to 5 minutes, or until al dente, drain and set aside to cool. Dip one wrapper into the hot water for a couple of seconds to soften. Lay wrapper flat on a cutting board or counter. 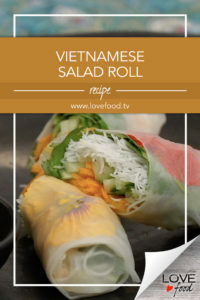 In a row, along once side of the wrapper, place a handful of vermicelli, basil, mint, cilantro, lettuce, and vegetables. Place nasturtiums on top third of paper. Fold ends inward, then tightly roll the wrapper. Slice in half and serve with Sauce.